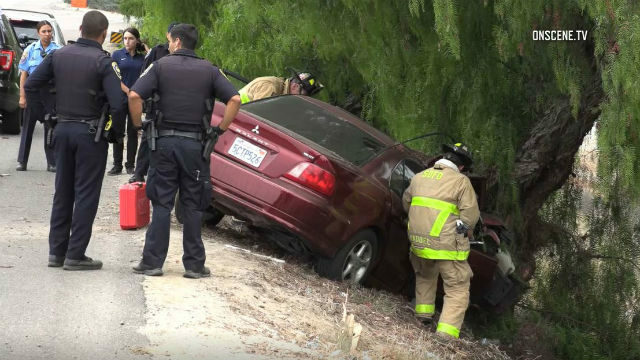 One of the two people trapped in a car that careened into a tree on the side of Interstate 5 in Chula Vista on Sunday has died, the California Highway Patrol confirmed Monday. CHP Officer Tommy Doerr said Monday that the passenger had died, but did not have information about the driver’s latest condition. Dispatchers received word of a car that struck a tree on the right hand side of the northbound 5 Freeway near J Street at about 9:40 a.m. Sunday. CHP officers closed the three right lanes, as firefighters worked to free the driver and a passenger trapped in the car, Chula Vista Fire Department Battalion Chief Darrell Roberts said. It took about 15 minutes to extricate the two people, Roberts said. Both were taken to local hospitals with severe trauma at the time.